This year I found a beautiful bowl I wanted to use as the base for a living floral design. Living, so there are no dropping needles or berries from cut greens to clean up late in the month. I hope this looks even better in February and March than it does today. 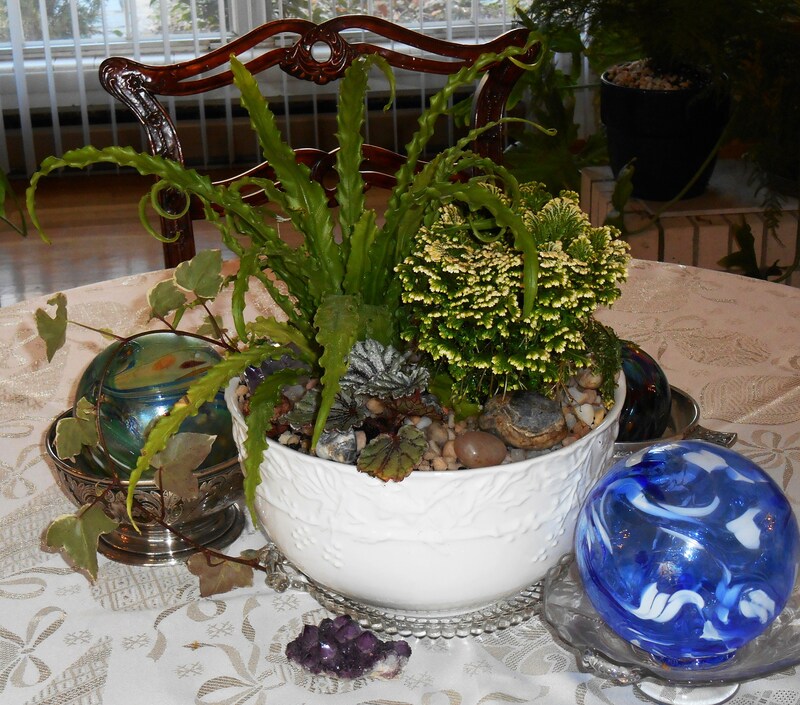 Eventually I’ll move these ferns out to other pots and reclaim the bowl for the kitchen. 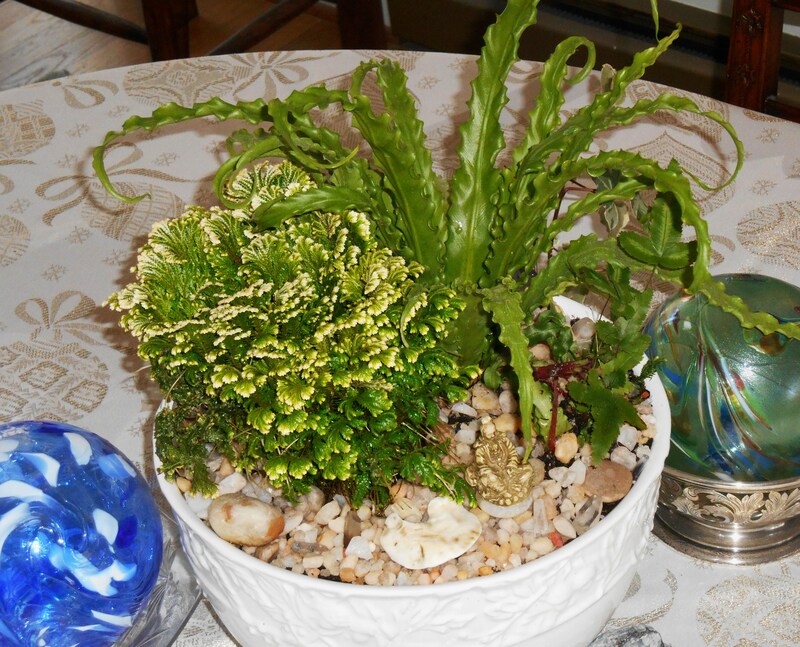 The frosty moss fern, found at Trader Joe’s, is a tough little houseplant. I bought my first ones this time last year, and they lived in the window sill all winter. Moved into a larger pot in the spring and grown out on the deck; they tripled in size, growing happily in the shade. These cascade as they grow and send out aerial roots. They like humidity and constant moisture. The bird’s nest fern, found at Lowe’s, is another excellent house plant which enjoys the same growing conditions. 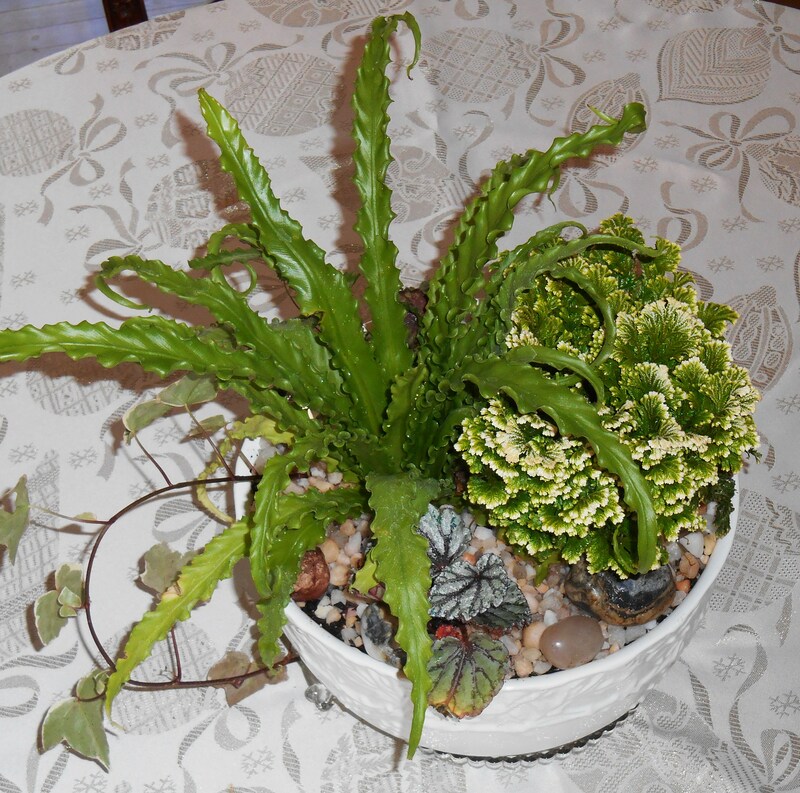 I moved the little Rex Begonia and fern planted a few months ago into the edges of this arrangement. Their bowl was too little for them to grow long term. I hope the Begonia will bounce back to fill in the edges of this arrangement. I know the fern will grow well here. Finally, I added one more tiny Rex found at Lowe’s in a 1″ pot to the edge of this design for some immediate color and contrast. The ivy is a rooted cutting from ivy growing outside. When planting in a pot with no drainage, it’s important to add a few inches of coarse material to serve as a reservoir for water. This helps prevent the soil from getting waterlogged if you over water. I used a few inches of sea shells and gravel, and then added good potting soil with food mixed in. Next came the plants, more soil to fill in the spaces around them, and finally a layer of gravel to dress the soil on top. Always break up the root balls slightly and splay the bottom few inches of root to encourage their growth out into the surrounding soil. Finally, I gave the entire arrangement a light spray at the kitchen sink to settle the soil and to rinse off the gravel. These ferns appreciate the moisture on their foliage and will enjoy getting sprayed with cool water from time to time. All of these plants enjoy high humidity and will dry out quickly. It is important to check them every few days by touching the soil. The top dressing helps conserve moisture. Observing the color and texture of the foliage is another clue to the health and happiness of the plants. Cover the shells with pea gravel to a depth of about two inches. Use good, fresh potting soil with food already mixed in. The soil is topdressed with pea gravel to make it look nicer, and to conserve moisture in the low humidity of the house. When choosing plants to enjoy indoors during the winter, make sure to choose plants which can thrive in low to medium light. If they begin to stretch out for light, move them to an area closer to your windows during the daytime and when you aren’t at home, then move them back to the dining table in the evening or when you’re entertaining. Another small fern, and a Rex Begonia are planted on the back side, where they should begin to fill in within a few weeks. 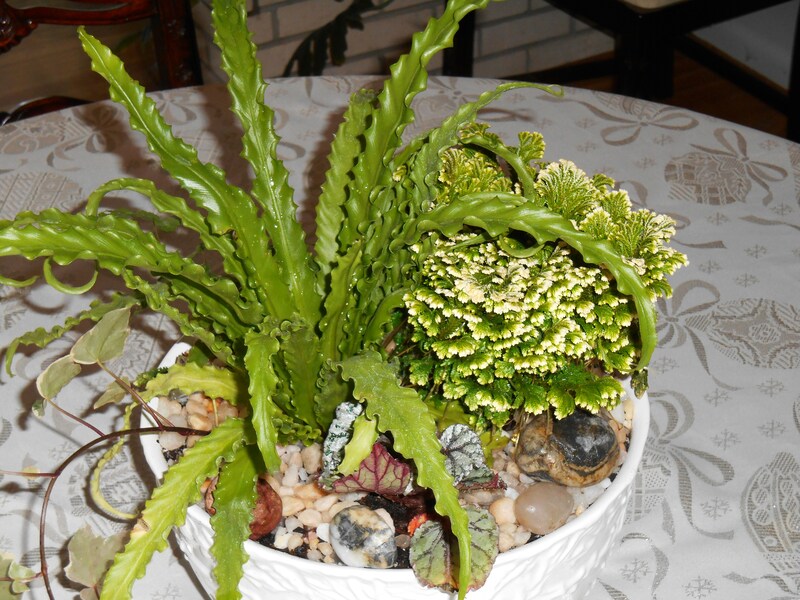 Other excellent choices to work in a similiar container would be poinsettias, orchids, cyclamen, and ivy. All of these tough and beautiful houseplants offer color and beautiful form, bloom during the winter, and are widely available in December. Christmas cactus doesn’t make my list because it demands brighter light, and the flowers are messy when they drop. I grow them, but keep them closer to the windows and grouped with other plants. So go ahead and construct a living holiday centerpiece now with an expectation to enjoy it for at least the next six to eight weeks. Let its beauty and color add to your enjoyment of the holiday season. It is not huge investment at all, especially if you use a container you already own. This arrangement, including the $10.00 bowl, came in at about $22.00. Every piece of it will be used again in another way after the holidays. What a beautiful gift for your own family, or for a loved one. Reblogged this on To Be Continued… Christine. I thought that we were having some lovely conversations, and for some reason(s), you seem to have changed your mind later, and have now “censored” our comments. I feel discouraged and I apologize for any misunderstanding. Thank you, woodlandgnome, for the clarification. I have just sighed a big relief. I am fine with our conversation being “show[n] to everyone who logs in”. In fact, retaining and showing our conversations on your posts and/or pages can not just encourage our people to join in the dialogues but also further extend the contents of your posts and pages. To enjoy faster Internet speeds, you will need ADSL 2+ or fibre optics cable. SoundEagle loves your creative bowl arrangement there. The silvery sellaginella is my favourite. The use of the rex begonia is unusual, and it is quite small, not quite in proportion to the rest. Perhaps an oval rather than a round bowl could even be better for the arrangement, plus a larger surface to show off your stone and pebble garnish.